Humminbird PiranhaMAX 196ci has an average rating of 3.2 out of 5 based on 5 user reviews. 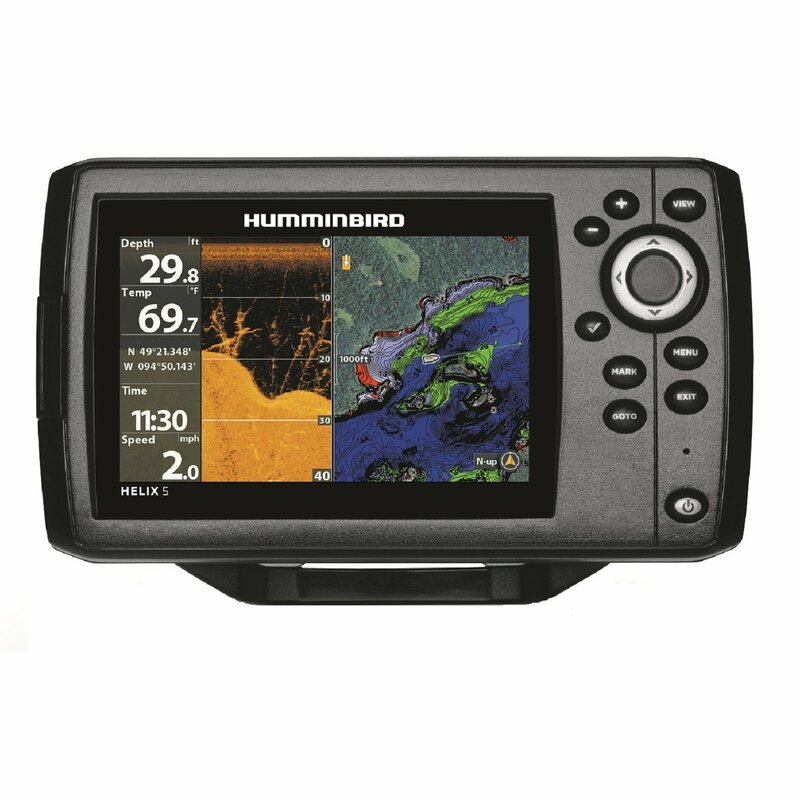 The Humminbird PiranhaMAX 196ci has precision internal GPS, a track plotter and GPS speed which makes it possible to know your speed as you sail through the waters. Waypoints, Routes and tracks are fully accessible with the 196ci. Its design allows drop-in replacement for the in-dash models. This fishfinder has track markers with a user-friendly interface. It has fish alarms, Fish ID, Zoom simplicity and depth alarms. With the PiranhaMAX 196ci mounted, you will be able to see everything in detail on contrast enhanced vivid Color TFT screen/ clear edge grayscale display. • Speed: Gps speed included. Humminbird 196ci uses exclusive dual beam, Fish ID, gps, and sonar. These features are superb as they provide detailed and accurate location of the fish using sonar technology. The sonar sends sound waves on virtual cone shape designs. The sound waves travel through the water and when they come in contact with obstacles or fish, they bounce back and the hummingbird 196ci displays the images generated from the reflections. For wide coverage and imagery preview, the Dual Beam technology comes into action. This has proven to be the one of the most arcurate way of detecting fish. The speed feature of the fish finder is very advantageous when it comes to finding Fish Arches. The speed determines the shape of arches. Slow speed’s results to straight arches, on the other hand, fast speeds results to more arches. If the fish is at the edge of the beam, more arches forms up. When the boat is moving fast or the fish, hook like arches forms. This indicates that the fish is further from the edge of the sonar cone. The PiranhaMAX 196ci has a bright display, which makes viewing possible even with radiant sunlight. The water-resistant capabilities of the Hummingbird assure that you won’t have to worry about its state during stormy weather. Since it has the twist and swivel mount, you can view different angles. It is tangle free and easy to mount. The Dual beam works by focusing a center beam that is surrounded by a second beam deviating at an angle of 60º. The extra beam expands coverage to an area equal to your depth. The center beam is to focus on objects at the bottom part of the water, hence displaying your structure, weeds and surrounding cover. The second beam is used to locate fish. Each beam works separately but can be combined for clearer results. You can get a great deal on Humminbird PiranhaMAX 196ci here. I just installed this fishfinder on my Jon boat. It give a nice picture of what’s below the boat and it didn’t take me hours to learn to use it which is usually the case with more expensive fishfinders. They advertise this as a GPS/fishfinder combo. It’s a poor man’s GPS – just a blue screen, no shore contours. Don’t buy this if you need real GPS. This unit has a surprisingly bright screen. I didn’t realize it until I found brightness setting in the menu. I’m very happy with this sonar. I got it on Amazon because of the great price and super fast, free delivery. Out of the vast array of transducers Humminbird produces only one will work with this unit. If you are looking for anything besides a transom mount then you are out of luck. The lack of selection for kayaks and small boats makes the portability of this unit useless. This unit shows some basic depth readings and fish ok. The menu is very unintuitive and takes a lot of getting used to. The worst part is that every time you move to a new spot the unit must be powered all the way down to get good readings again rather than the garbage is shows at higher speeds. I tried to figure this out with customer service. My mistake. They were not knowledgeable about the product at all. The only answers I was given were the ones I had already read out of the manual that came in the box. I will avoid Humminbird in the future.